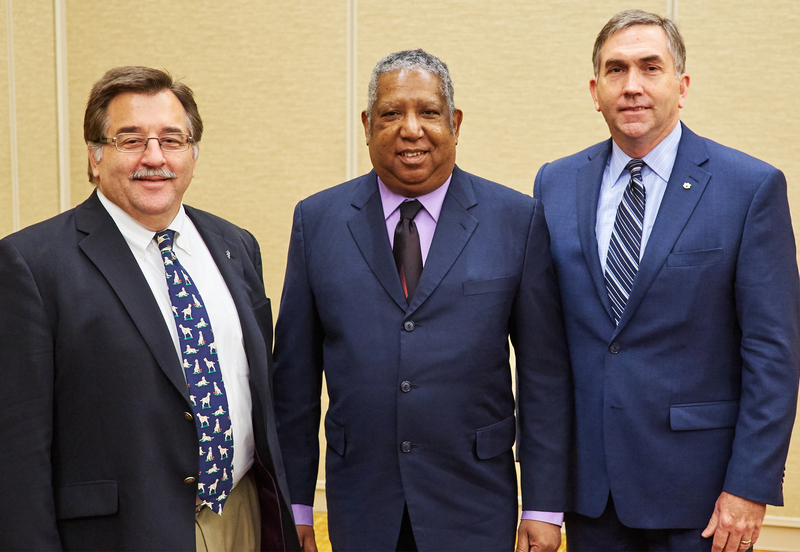 From left: Past-president Dr. Douglas Freeman, dean of the Western College of Veterinary Medicine at the University of Saskatchewan, President Dr. Phillip Nelson, dean of the Western University of Health Sciences College of Veterinary Medicine, and President-elect Dr. Calvin M. Johnson, dean of the Auburn University College of Veterinary Medicine. Dr. Calvin Johnson, dean of the Auburn University College of Veterinary Medicine, was recently installed as president-elect of the Association of American Veterinary Medical Colleges (AAVMC). Dr. Johnson is a 1986 graduate (DVM) of Auburn University and in 1992 earned the Ph.D. in pathology and biotechnology from North Carolina State University. He achieved board certification in anatomic pathology by the American College of Veterinary Pathologists (ACVP) in 1993. Dr. Johnson served on the faculty of the University of Florida for 11 years before moving to Auburn. He served for six years as department head of Pathobiology and one year as acting dean before being named dean of the College of Veterinary Medicine at Auburn in 2013. Other AAVMC leadership include: Dr. Phillip Nelson, dean of the Western University of Health Sciences College of Veterinary Medicine in Pomona, California, as president; University of Wisconsin School of Veterinary Medicine Dean Dr. Mark Markel continues as treasurer, and North Carolina State University College of Veterinary Medicine Dean Dr. Paul Lunn was named secretary. Western College of Veterinary Medicine at the University of Saskatchewan Dean Dr. Douglas A. Freeman transitioned to the immediate past-president position. At-large board members include Oregon State University College of Veterinary Medicine Dean Dr. Susan Tornquist, Region 1 (U.S.); University of Melbourne School of Veterinary Medicine Head Dr. Ted Whittem, Region III (Australia, New Zealand, Asia); and Pennsylvania State University Assistant Professor of Comparative Medicine Dr. Tiffany Whitcomb, representing departments of comparative medicine. New board liaisons (non-voting) include Washington State University College of Veterinary Medicine Dean Dr. Bryan Slinker, representing the Association of Public and Land Grant Universities (APLU); and Mr. Aaron Colwell, representing the Student American Veterinary Medical Association. The member institutions of the AAVMC promote and protect the health and well-being of people, animals and the environment by advancing the profession of veterinary medicine and preparing new generations of veterinarians to meet the evolving needs of a changing world.